Small as Olympia is, they sure seem to have that whole food and libation thing down there. Sage's is a good example. And if you like coffee, you probably should check out Olympia Coffee Roasting Company. Really, we don't toss out "world class" hyperboles here too often, but that's exactly what you get at Olympia Coffee. The only spot with better cappuccinos we can think of is Tim Wendelboe. With the airplane prices being what they are right now, going to Olympia is probably your better, or at least cheaper, bet. The coffee bar is located in a small portion of a building that also houses the roaster. A glass of sparkling water accompanies whatever coffee drink you choose, and the cups and glasses come served on a wooden tray. Classy stuff. Now, the cappuccino is a fickle friend. Getting the coffee to milk ratio properly down is more of an art form than many realize, and too often the milk is there just to drown out poorly pulled espresso shots. Here they got it right, the coffee, the milk, and the foam, each one flanking the others perfectly. It's that holy balance that makes a cappuccino great, where each part is equal, yet they mix together to create something greater. The employees are clearly coffee nerds, but they're also friendly coffee nerds which is... Well, frankly, almost unheard of. 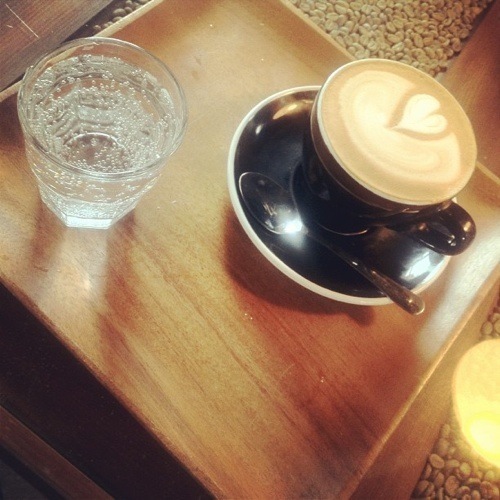 Olympia Coffee Roasting Company is a destination, a spot any lover of coffee should stop by. We haven't visited every coffee destination in the Northwest, but this is our favorite, at least for now. Do you recommend Olympia Coffee Roasting Company? Make your voice heard!